MultiCharts is an award-winning trading platform. Whether you are a new trader or a professional, MultiCharts has features that may help you achieve your trading goals. High-definition charting, built-in indicators and strategies, one-click trading from chart and DOM, high-precision backtesting, brute-force and genetic optimization, automated execution and support for EasyLanguage scripts are all key tools at your disposal. Freedom of choice has been the driving idea behind our MultiCharts and you can see it in the wide choice of supported data feeds and brokers. Choose your trading method, test it, and start trading with any supported broker you like—that's the advantage now of MultiCharts. 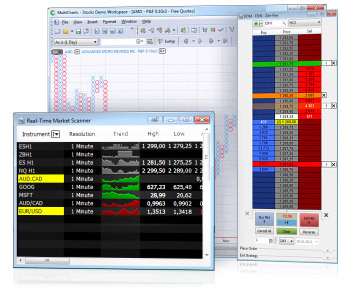 Known as a "screener", or “quote board”, this tool lets you monitor thousands of market symbols in one window to find profitable opportunities. An investment in financial instruments involves risks, including the possible loss of principal. The rate of return will vary and the principal value of an investment will fluctuate. Shares, if redeemed, may be worth more or less than their original cost. Asset allocation does not assure a profit or protect against down markets. The stocks of smaller companies may be subject to above-average market-price fluctuations. There are specific risks associated with international investing, such as currency fluctuations, foreign taxation, differences in financial reporting practices, and rapid changes in political and economic conditions. Real estate investments may be subject to specific risks, such as risks related to general and local economic conditions and risks related to individual properties. Fixed income securities are subject to interest rate risk, prepayment risk and market risk. An investment in financial instruments involves risks, including the possible loss of principal. Hypothetical performance does not guarantee future results and the investment return and principal value of an investment will fluctuate so that an investor's shares, when redeemed, may be worth more or less than their original cost. Current performance may be higher or lower than performance quoted. Not FDIC Insured * May Lose Value * Not Bank Guaranteed.